Monticello is an important source of Charlottesville’s history, cultural identity and economic vitality. In combination with the Academical Village at the University of Virginia it is a nearly unmatched resource and very unusual for a town of this size. Monticello is close to the city (its lands are less than a mile from the border) and it is visible from many locations, yet it is difficult to get there without a car. This discontinuity poses problems of equity and unrealized opportunity for Monticello, the city and the region. Monticello was once easily accessible. There were multiple routes into town with significant travel and exchange in both directions. When Interstate 64 was built (in the 1960’s and 70’s) all of those routes were severed except for one (VA-20) and that was widened for highway speeds without accommodation for bicycles or pedestrians, effectively cutting Monticello off from those who do not have—or choose to use—a car. There is no transit connection, which limits residents and visitors alike. The Thomas Jefferson Foundation, which owns and operates Monticello and much of the surrounding lands, bridged half the distance in 2000 by opening Saunders Monticello Trail. This winding two-mile pathway is fully ADA accessible (while climbing a mountain!) and its beauty attracts tremendously diverse visitorship. Combined with the adjoining parkland, it is a wildly successful landscape and a destination in its own right yet it is difficult to get there with a vehicle and nearly impossible without one. The core of the study area, showing roads, parcels and institutional landowners. The remaining gap, subject of this study, is small but complicated. The highway itself is a formidable physical and psychological barrier. The zone is split between two jurisdictions (Charlottesville and Albemarle County) with a third (Virginia Department of Transportation) in between. There are multiple institutional landowners as well, most of whom would like to solve the problem but none able to tackle it alone. A collaborative process will be required. 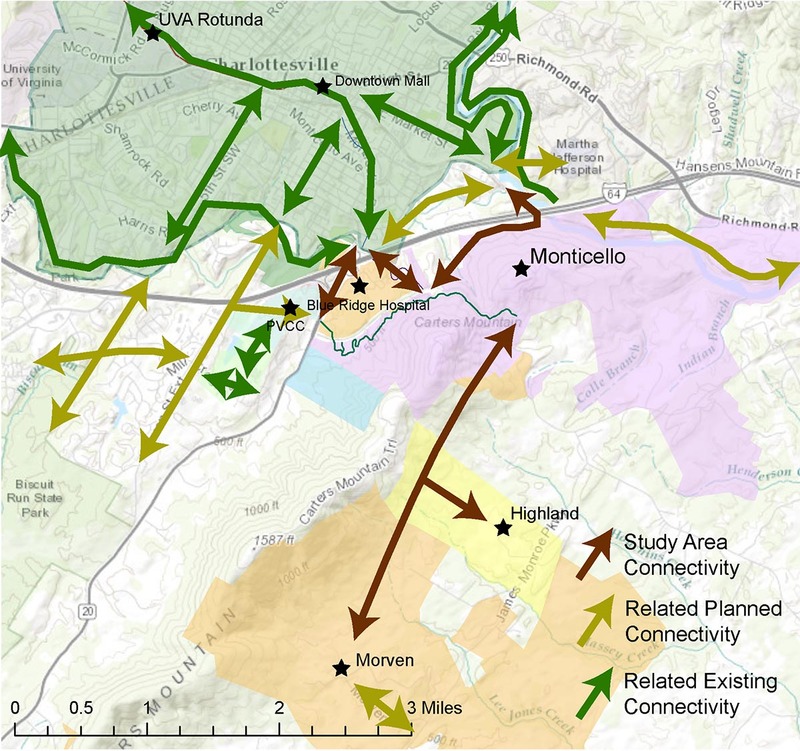 Both the City and County’s Comprehensive Plans mention Monticello connectivity or show it on their maps but they are not coordinated. Additionally, Morven has begun a study for a trail from its vast and historically significant lands south of town, through James Monroe’s Highland to Monticello. The regional Thomas Jefferson Planning District Commission (TJPDC) has begun a decennial revision of its 2004 Jefferson Area Bike and Pedestrian Plan and this segment will be a crucial part of it. As part of that process, the TJPDC is sponsoring a spring study by Masters students (including myself) from University of Virginia’s department of Urban and Environmental Planning. We will provide research support. 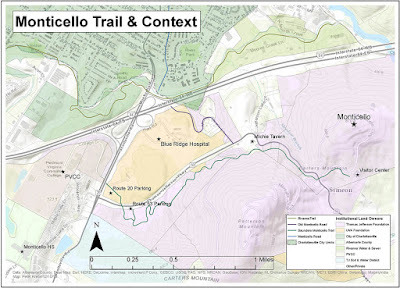 This document provides background for the Monticello Connectivity portion of that work by identifying key stakeholders and issues, and examining the overlapping spatial factors such as jurisdiction, land tenure and legacy infrastructure that make this problem complicated. It evaluates the current planning environment to determine whether a collaborative approach is likely to succeed. Connectivities within and related to the study area. The key stakeholders are motivated and ready to work together but they need coordination. They have good but mostly informal working relationships. Multi-jurisdictional plan integration is not the local norm, but that might be changing. The TJPDC decennial process will provide coordination and yield recommendations but it is not advocacy. Stakeholders will need implementation strategies and funding. To be successful, this project needs to pay attention to the regional context and look at opportunities near (but outside of) the study area, such as Piedmont Virginia Community College and the County’s Southern Neighborhood area. It is not only about trips to Monticello from Charlottesville. The notion that the trail could extend all the way to Morven, and connect Highland, is extraordinarily compelling and appears within reach. 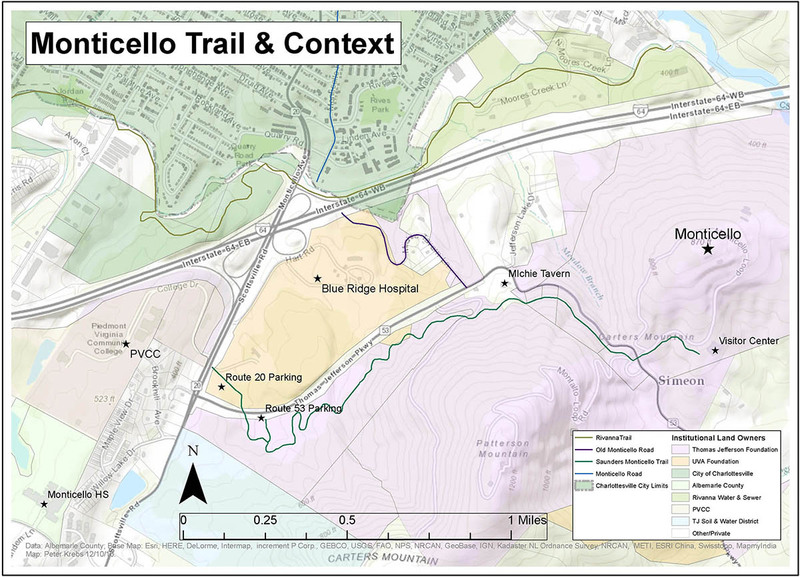 The issue of connectivity and accessibility to Monticello (and the other sites) is not only a physical question. It has an important socio-historical component, which the Thomas Jefferson Foundation is actively engaging. This trail would therefore not a typical piece of infrastructure: it would be a physical expression of historical and cultural discovery. That history is being energetically debated, contested and expanded. The trail will have to acknowledge and reflect that. The landscape in question is quite beautiful, with many opportunities for recreation and education. The entire pathway from Morven to the UVa Rotunda (and beyond) via Highland, Monticello, the Saunders Trail, Belmont, the Downtown Mall, the Jefferson School and West Main carries nearly infinite possibilities for interpretation, programming and storytelling. Planning history and theory recommends circumspection: even though this project seems very beneficial, there could be hidden downsides, such as residential or business displacement. There is no specific evidence that this is likely, but it is serious enough to merit investigation. This will not be a typical amenity or recreational trail. It is a connection between two halves of a UNESCO World Heritage site; a region and the full telling of its history; a community and a vast zone of ecological and cultural discovery. There are challenges but very high and very likely rewards. It is an exciting project and an opportunity to model a better collaborative approach between neighboring localities, governments and foundations to unlock a shared opportunity. The situation is ripe for a collaborative master planning process to proceed. 1. That segment is part of National Bike Route 76, notwithstanding its unsuitability. 3. 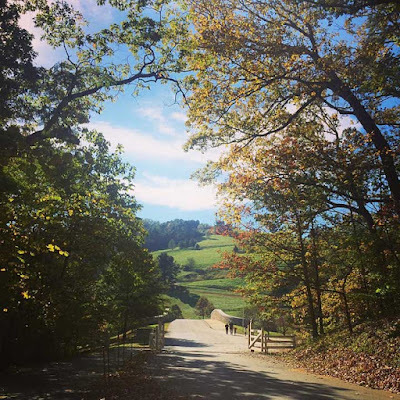 The University of Virginia Foundation owns Morven as it does the Blue Ridge Sanitarium site, which occupies much of the land between Charlottesville and the Saunders Trail.